As you approach this elegant Bermuda-style home, you would never guess that it was once hidden behind a jungle of trees and subtropical shrubbery, obscuring its potential to be a modern family home in one of Naples’ best locations. Looking at it today, it’s also impossible to tell that it has undergone four renovations in its past life because this, the fifth and last renovation, was done with such vision, skill, and care. This beautiful home has at last been transformed into the modern Old Naples estate it was meant to be. Williams enlisted the talents of architect Alberto Abad of New Architectura and builders Jay Bowerman and Jaider Gonzalez of Big Island Builders. The team set to work designing an additional wing and new entry worthy of the home. “We felt it was important to change the orientation of the entrance to create more curb appeal and to give the home a true Gulf Shore Boulevard address. Also, the original two-story wing made the home feel off balanced,” comments Abad. Throughout the home, August’s unique ability to layer color, retro styles, and whimsical elements creates an interior that speaks to the history of the home and its setting, while looking towards the bright future it’s sure to have. As the Bermuda-style home is viewed from the new custom-poured shell driveway one would never guess at the extensive redesign and artfully executed renovation which took place. The orientation of the home was changed from the narrow side street to face Gulf Shore Boulevard, a second two-story wing was added on the right, and the triple-arches were changed to reveal a new grand entryway. “It took a lot of structural re-engineering, but I’m glad we were able to add the arches because they look spectacular as you approach the house,” notes builder Jay Bowerman. “This home was about surprise elements for me—from the way a hallway would open into an intimate sitting room, to accent items found throughout, I wanted people to be excited about each new space—,” says August. An expertly curated mix of traditional formality and a relaxed lifestyle is apparent. The sleek silhouette of twin Maison sofas pairs with the gold finish of the coffee and side tables offering an ’80s vibe. The art in this room is from August’s Wendover collection, inspired by her love of Florida’s always beautiful sky. The large antique mirror was retrofitted for the home and plays off the arched windows it reflects. The French country kitchen is consistently one of the favorite rooms in the home. Designed by Carol Ruffino and manufactured by Ruffino Cabinetry, the Alabaster White-finished cabinets provide the perfect canvas on which to build. Wire-grill door inserts with limed oak T&G backs, and shelves with custom iron brackets complement the beautiful limed oak island. Ruffino’s design incorporated a Lacanche Chassagne Classic Art Culinaire French range. Williams used the French pastry table at the end of the island to enhance the classic European look. Calcutta Gold marble and French white oak flooring complete the space. Filled with saturated color and textural layers, the dining room is a space that gives the homeowners a truly formal entertaining area. 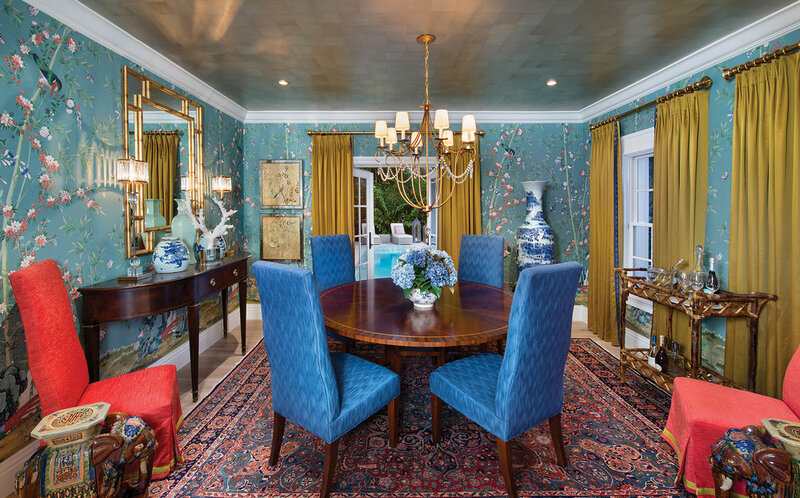 American made chinoiserie wallpaper represents a new opportunity for designers as it replaces the more expensive and labor-intensive hand-painted method. The wallpaper sets the color scheme and period for the room, and is accented with the punch of Chinese red and oversized porcelains. The dark wood dining table sits on a rug that reinforces the traditional feel. “I wanted to create a distinctly masculine area in this house and I think this room turned out to be a wonderful space with a global feel,” says Williams of the billiards room. Roman shades, the animal skin rug, and antler accents add exotic touches to the classic pool table and leather sofa. The artwork is from August’s Wendover Collection. The Leif secretary desk with an Antique Linen finish is a staple of August’s line. 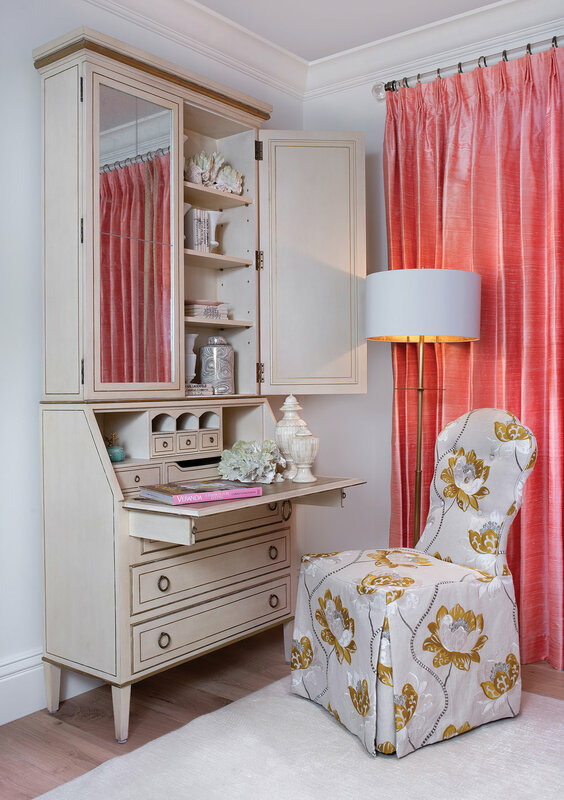 An Arden Court chair with imported fabric completes this cozy workspace. French doors dressed in coral draperies fabricated by Statewide Window Treatments open onto the travertine pool deck. Flowers shown are courtesy of the Naples Garden Club. This room is beautifully appointed with nautical art and colors. The perfect place for a fun sleep over, twin bunk beds create plenty of sleeping space. Leather ottomans at the foot of the bed are a durable and fashionable seating option for kid-friendly spaces. The pool area created a unique set of challenges for the builder and architect. Because the lot was fairly narrow and the orientation of the home had been changed, they had to be creative in working around their setback requirements. Abad’s solution was to cantilever the home, giving the exterior more visual interest while adhering to the city’s guidelines. The tiered Travertine pool was another clever solution, and creates a unique entertaining space. Large pink flamingos by Ed Koehler add a tropical pop of color to the neutral tones of the pool area. This 5,438 square foot home features four bedrooms and six baths and is available for $7,999,000. Contact Olde Naples Real Estate for more information.